Nephi, that great hero of the Book of Mormon, is often viewed as a pinnacle of devotion: steadfastly faithful, profoundly spiritual, and unwaveringly obedient. But the beautiful passage of scripture often referred to as Nephi’s Psalm reveals that, like all of us, Nephi faced his own inner struggles in this mortal existence. His heartfelt introspection demonstrates that amid the trials of life, discouragement can burden us all—but it can also be overcome. 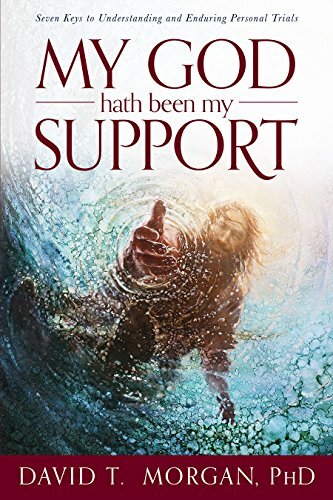 In My God Hath Been My Support: Seven Keys to Understanding and Enduring Personal Trials, author David T. Morgan looks to the words of Nephi’s Psalm to offer an inspiring message of hope and a loving call to action. Featuring tools and ideas on how to overcome adversity, increase feelings of self-worth, and endure the ups and downs of mortality, this scripture-based roadmap to a more fulfilling life is a joyous invitation to learn from Nephi how to transform sorrow into joy. This is a pretty short book (less than 100 pages) but it is not a quick read. I mean, I guess you could read it in a few hours, but I don't know how much you would get out of it if you did it like that. Instead, I think this book is meant to be read one chapter at a time, giving yourself time to ponder and honestly answer each of the questions that are given at the end of each chapter. The author uses a lot of scripture references - usually about Nephi - to show the reader examples of how we can get through our own personal trials, no matter how big or small they are. This book would be a great addition to your daily scripture study as you read the scriptures referenced in each chapter and study them more in depth. Like most of the non-fiction books that I've read in the last few years, this book now has several pages marked so I can go back and reference areas that really jumped out at me, such as "Hatred is such a damaging emotion, and it usually harms the person who feels it more than the object of his hatred." This book is filled with information on prayer, anger, forgiveness, and being humble, to name a few. I found so many good ideas in this book, and plan on adding this to my "come back to over and over again" shelf.